Al, a janitor, and his faithful dog, Eddie, live in a single room on the West Side. They eat together, they work together, they do everything together. So what's the problem? Thier room is crowded and cramped; their life is an endless struggle. Al and Eddie are practically at eachothers throats when a large and mysterious bird offers them a new life in paradise. After some debate, they decide to accept. Transported to a gorgeous island in the sky, Al and Eddie are soon living a life of ease and luxury. But they come to find that the grass can be a little too green on the other side. After a dramatic, nearly tragic escape from their paradise prison, both man and dog agree: there really is no place like home. 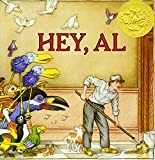 Hey, Al is the winner of the 1987 Caldecott Medal.